The heated products of combustion from a fire have a natural buoyancy, which causes them to accumulate in the upper levels of a structure. In a high-rise building the stairways, elevator shafts, and utility shafts are natural paths for the upward migration of heated products of combustion. Stack effect is a natural phenomenon affecting air movement in tall buildings. It is characterized by a draft from the lower levels to the upper levels, with the magnitude of the draft influenced by the height of the building, the degree of air-tightness of exterior walls of the building, and temperature differential between inside and outside air.6 This effect was particularly strong on the night of the fire due to the cold outside temperature. Interior air leakage rates, through shaft walls and openings, also modulate the rate of air flow due to stack effect. Smoke and toxic gases become entrained in this normal air movement during a fire and are carried upward, entering shafts through loose building construction or pipe and duct penetrations. The air flow carries smoke and gases to the upper portions of the structure where the leakage is outward. At the upper portions of the structure, smoke and toxic gases fill the floors from the top floor down toward the fire, creating a dangerous environment for building occupants and firefighters. 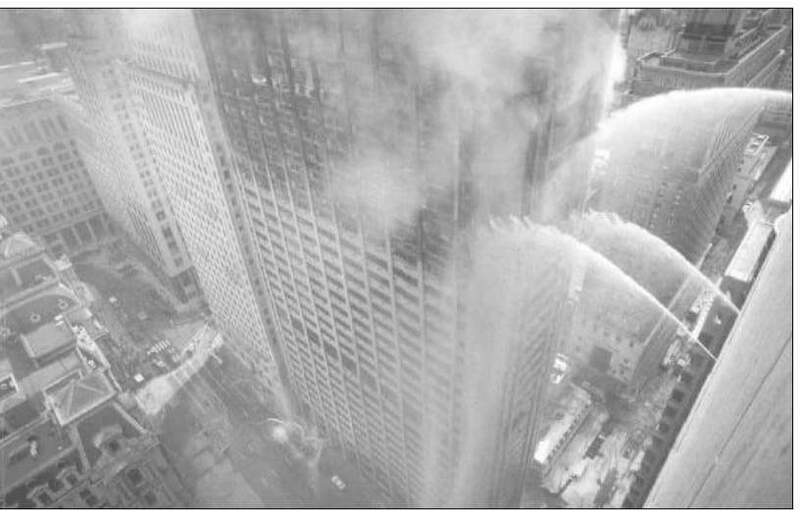 During the investigation of this fire, this upward flow was evidenced by the presence of heavy soot in the 38th floor mechanical room and all the upper floors of the building. The path of smoke travel to the upper floors was vividly evidenced by the soot remnants in HVAC shafts, utility chases, return air shafts, and exhaust ducts. Fuel loading on the fire floors consisted mainly of files and papers associated with securities trading and management consulting. At least one floor had a significant load of computer and electronic equipment. In some cases, correlation could be found between heavy fuel load and damage to structural members in the affected area. From the 22nd floor to the 29th floor, the fire consumed all available combustible materials with the exception of a small area at the east end of the 24th floor.